Spring time is right around the corner and some of us might be cleaning out closets our soon. You can recycle old sweaters as home decor. For example, I used a sweater that I wore when I was a baby. My mom found it recently after having kept it all these years. There was a little hole in it but neither one of us wanted to throw it away because it was sentimental and so pretty. 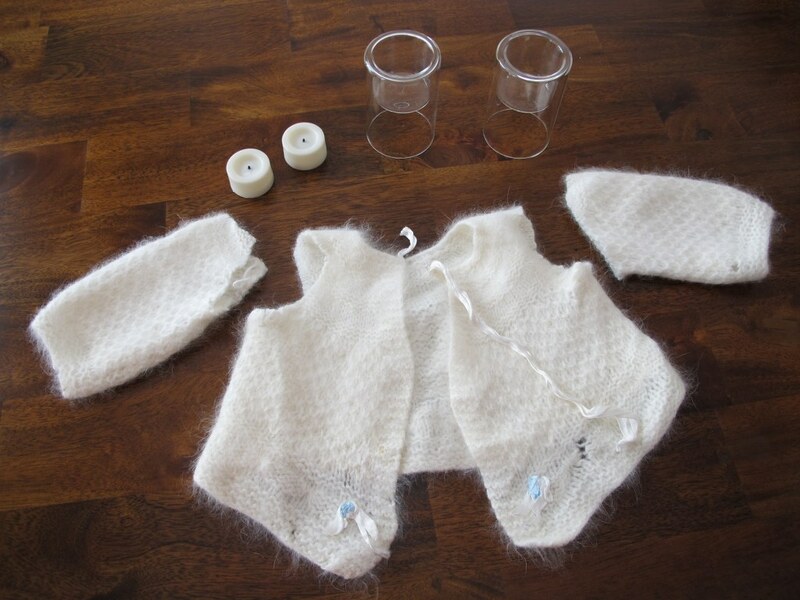 The arms from the sweater were the perfect size to cover votives. I am not the “Do It Yourself” kind of girl, so trust me when I say this project is very easy. Cover the votive and tuck the unfinished end of the sleeve under the votive. 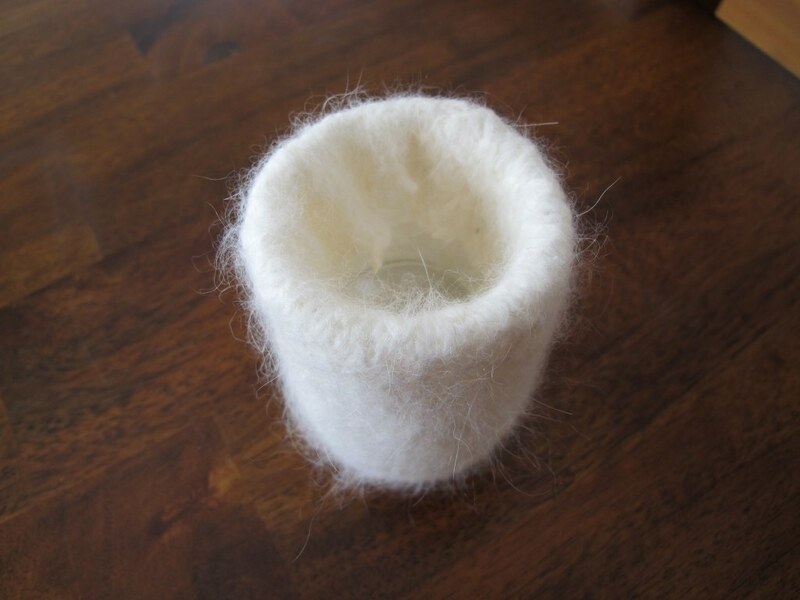 If your votive isn’t shaped this way then you may want to use a few dots of hot glue to hold the sweater in place. I like using flameless candles because I don’t have to worry about the sweater catching fire. My advice is that you not use real candles to avoid a fire hazard. 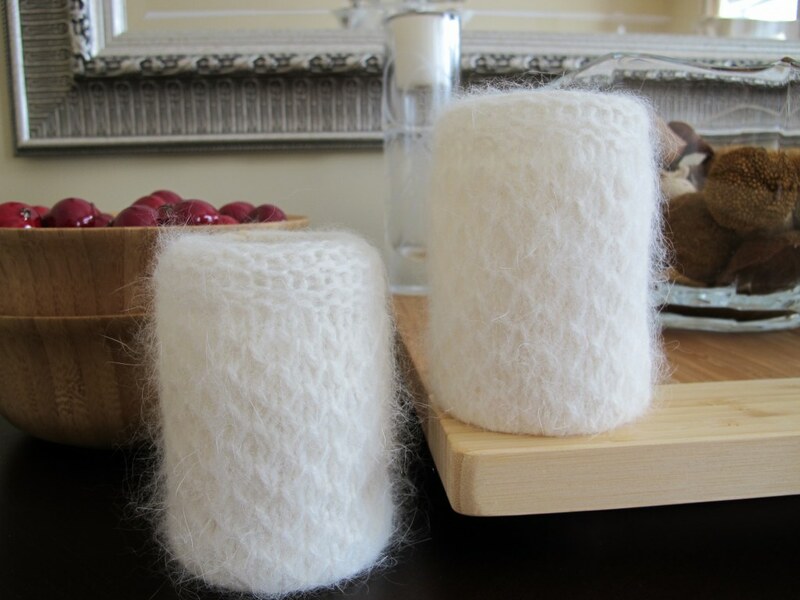 You can integrate the votives into any Autumn or Winter decor, using a sweater color that works best with your own color scheme. Cover a wine bottle with a sweater sleeve, to use as home decor or even to present as a hostess gift. Cover a tea cup with a sweater sleeve, for home decor, which is a nice way to dress your dainty, flowery tea cups for the Autumn or Winter weather. Cover a hurricane glass with a sweater sleeve then insert a candle and the flame looks so pretty as it peaks out of the various nooks and crannies of the sweater. Cover a vase with a sweater sleeve then fill with flowers to make for more fall-like or wintry floral arrangement. You can get even more creative by wrapping ribbon around any of the ideas. For example, wrap ribbon around the neck of the wine bottle or wrap ribbon around half way up the hurricane glass. The ribbon will add another lovely detail to the look and be functional to hold the sweater in place if you don’t want the sweater to be permanently stuck to the bottle or glass. I was inspired by Jacinda to do this project.